Artwork may not be used for creation of goods/products, advertising, or promotion. No two people are exactly alike, which means that no two friends will have the same way of relating to us. Some we can trust to help us with certain tasks that our other friends will not assist us in completing. We have some close friends who will never say a critical word about anything we have done or are thinking. If we are truly fortunate, we will have at least one friend who will be honest with us and offer needed criticism that will help us improve ourselves and our walk with Christ. Today’s passage has such a friend in view. Proverbs 27:17 likens the interaction between two faithful friends who are seeking the improvement of one another to the sharpening of an iron stone or other iron tool against an iron sharpener. The analogy is even clearer in the Hebrew, for the second half of the verse can be translated “one man sharpens the face of another.” Just as a man might sharpen the face of his sword against a sharpening iron in order to make it more suitable for combat, so does a faithful friend equip his friend for success by constructive criticism. Giving a tool the desired sharpness took time in the ancient world, as there were no electric whetstones or other sharpening devices. Persistent, careful striking of the tool against the sharpener was required, and the process lasted longer than a matter of seconds. Thus, the proverb is underscoring the importance of persistence in friendship. One man does not sharpen another with just one speech or dialogue, though words spoken in the right season can go quite far in helping improve another person. Instead, people sharpen one another over time, through years of friendship and all of the ins and outs that come with enduring relationships. A truly constructive friend is faithful over time to offer his criticism and instruction, and he does not give up the first time his friend does not heed his advice. Personal and spiritual growth is a communal affair, as Scripture reminds us in various ways. In the beginning, God did not make just one human being but two (Gen. 1:26–27). David had Nathan the prophet, a faithful friend who brought him to repentance (2 Sam. 12:1–15). Jesus appointed not just one overseer; rather, He has chosen for His church to be governed by a body of elders and deacons (Acts 6:1–7). We all need others in our lives to sharpen us and encourage us in the work of ministry. 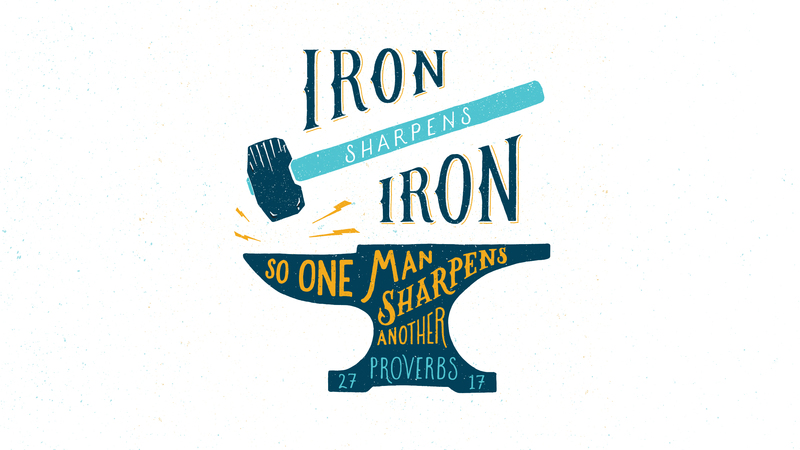 Do you have other “irons” in your life who can help in sharpening you? We are blessed indeed if we have at least one friend upon whom we can count for loving, constructive criticism. If we do not have any such people in our lives, we should be looking for them. We should also be asking the Lord to help develop us into people who can offer such criticism to others and to enable us to persist in love toward our friends and others. If you'd like to purchase prints of this design, it is available in our shop in various size and color options.